Navigate to cms page or static block edit page and insert shortcode or widget. Enable Magento maintenance mode. To enable the maintenance mode you can create a simple empty file named .maintenance.flag in your Magento’s var directory. Magento will be offline after that. You will need to disable the maintenance mode after installation by removing this file. 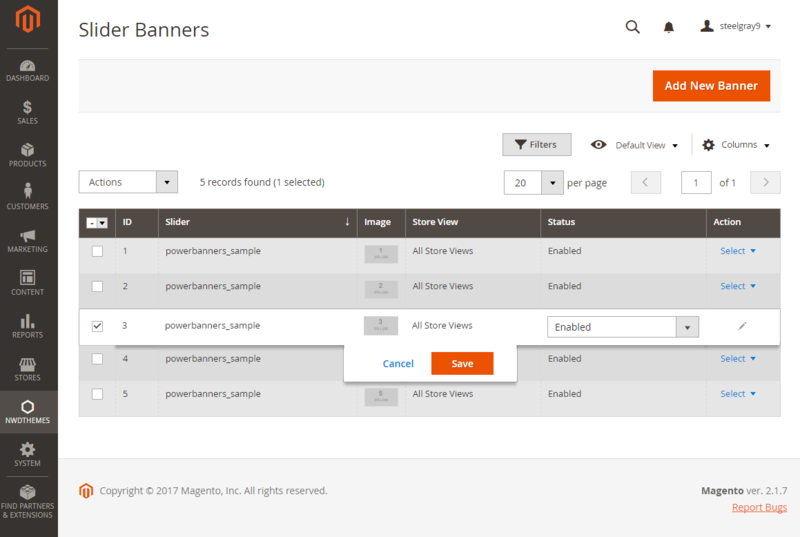 Powerbanners is now installed on your Magento system. You can create your own text styles for banners. 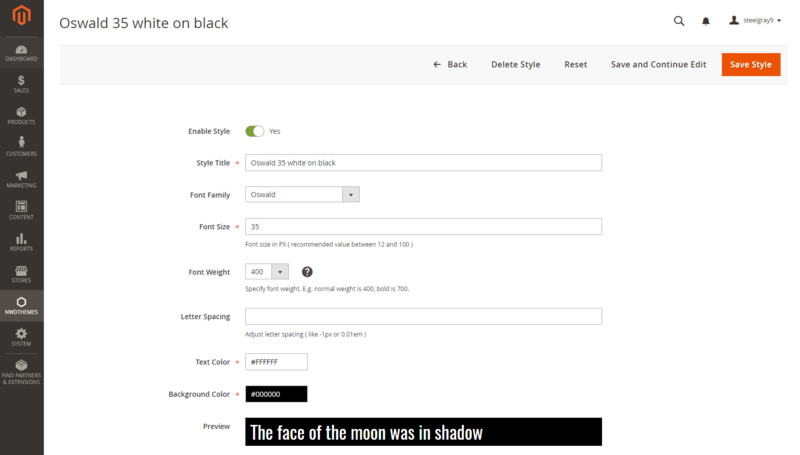 Choose from over 600 google fonts, update font weight, font size and letter spacing. Custom CSS – Add custom css to slider to override default css rules. Slider class is based on slider alias. If alias = sample, class = .nwd_pb_sample. You can use it to apply custom css for certain slider. Banner Width – Banner Width. Banner images will be resized to these dimensions. Create / edit your banners. Upload images, assign text styles, add link and choose if you want to open it new or same window. Retina screens also supported. 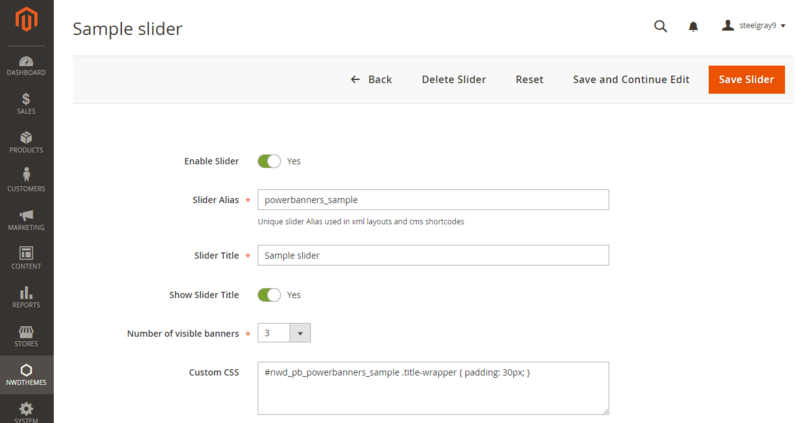 You can insert Powerbanners slider in any cms page or static block using this code. Please note that my_alias is used for reference. You should change it to your slider alias. To insert Powerbanners Slider Widget in CMS editor click “Insert Widget” icon or button. Select NWDthemes Powerbanners widget. In Widget Options select slider you want to insert and click Insert Widget button. The following chapter describes some of the basic Magento settings and features. Magento’s cache management system is an easy way to improve the performance of your site. Whenever a cache needs to be refreshed, a notice appears at the top of the workspace to guide you through the process. Follow the link to Cache Management, and refresh the invalid caches. To access the cache management screen, you can also use the link in the admin panel menu: System > Cache Management. Always refresh the cache after making changes in the configuration of your Magento/themes/extensions or after making any custom changes in the files. Go to System > Cache Management. Click Select All link, select Disable in Actions field and click Submit button. Go to System > Cache Management. Click Select All link, select Enable in Actions field and click Submit button. If the cache is enabled, after each configuration change, extension installation, upgrade or uninstallation always refresh the cache. Go to System > Cache Management. Click Select All link, select Refresh in Actions field and click Submit button. Magento reindexes automatically whenever one or more items change. Actions that trigger reindexing include price changes, creating catalog or shopping cart price rules, adding new categories, and so on. To optimize performance, Magento accumulates data into special tables using indexers. As the data changes, the indexed tables must be updated—or reindexed. Reindexing is performed as a background process, and your store remains accessible during the processes. To access the index management screen, go to System > Index Management. using console command which reindexes selected indexers, or all indexers, one time only. Please read this documentation carefully, it will help you eliminate most of potential problems with incorrect configuration of the extension and Magento. If you don’t find the answer to your questions, please refer to this chapter for more information about support policy: Help & Support > Support Policy.